"Our Honda and Acura dealers delivered a strong January and have put us on course for a fast start in 2019, despite extreme weather conditions throughout much of the country during the last week of the month," said Henio Arcangeli Jr., senior vice president of the American Honda Automobile Division. "While solid sales of our light-truck offerings continue, our balanced results across other segments of our business further showcase real consumer demand beyond trucks and SUVs." Continuing sales momentum from late 2018 led the Honda brand to a new January truck sales record—a strong start for 2019 despite severe winter weather that suppressed car shopping in the last week of January. CR-V was the biggest gainer, and Accord had a strong month as well. Fresh from an all-time sales record month in December, CR-V gained a robust 19.8% on sales of 29,152. 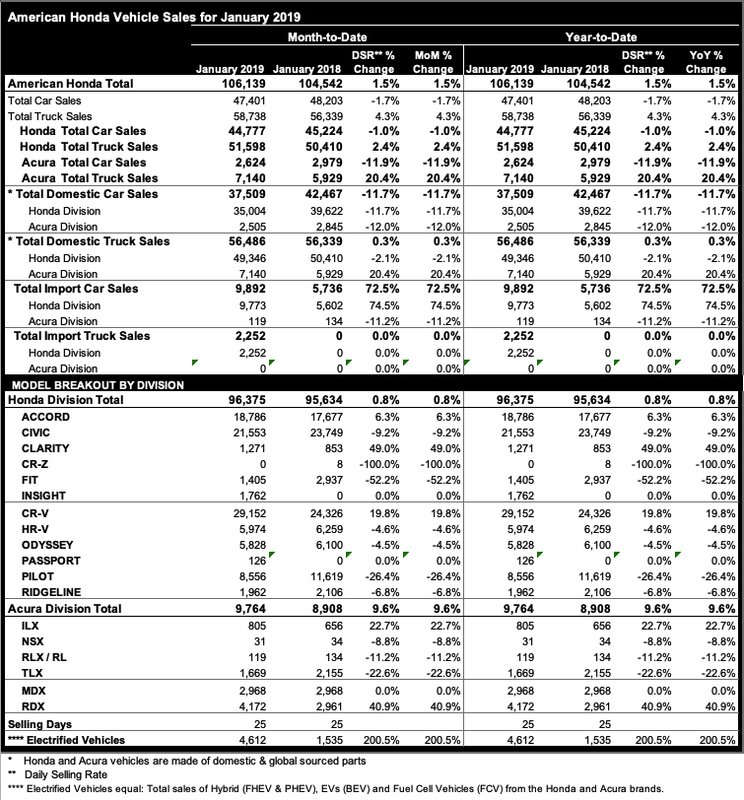 Accord finished January up 6.3% continuing momentum that saw it lead the mid-size segment in retail sales over the entire second half of 2018. Civic topped 21,000 units in sales to continue its dominant performance, as America’s best retail-selling sedan in 2018 begins its quest to lead the compact segment in retail sales for a 10th straight year. Civic continues its dominance as the #1 retail car in America for a 3rd straight year and 9th straight year as the compact retail #1. Honda Pilot was the fastest growing SUV in segment in 2018, helping deliver a 4th straight year of record light truck sales to Honda. Acura brand sales withstood the polar vortex in late January to post a 9.6% gain for the month, with RDX leading the brand with a 41% increase. RDX continued its record sales march unabated, setting a new January benchmark with 4,172 vehicles sold for a gain of 40.9%. It was the 8th straight record sales month for RDX. Acura light trucks just missed an all-time January record on sales of more than 7,100 units. RDX gained 42.2% to set a new December mark on sales of 6,838 units, the model’s 7th consecutive monthly record and second best month in history. ILX sales were up 22.7%, just ahead of the start of the marketing campaign for Acura’s redesigned gateway model, refreshed for 2019. Heading into December, RDX was the #1 retail-selling model in segment in 2018, the #2 top-selling luxury SUV and the #3 top-selling model in all of luxury. ILX picked up more than 2 points of share in segment in 2018, while TLX outsold the BMW 3-Series, Audi A4 and key models from Lexus and Volvo. Where is the Passport on Honda's website? MDX the exact same number really?